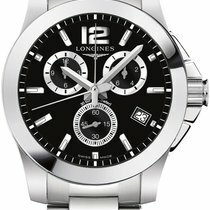 The Longines Conquest Collection is defined by sporty, elegant designs which go well with athletic wear and business suits. The top watches in this collection have precise quartz movements and can withstand the impact of jolts and magnetic fields. Longines' Conquest Collection features incredibly precise quartz timepieces as well as mechanical watches. These watches have a sporty, elegant design and are made for lovers of sports watches who also want to be able to wear their timepiece to the office. One highlight is the Longines Conquest V.H.P., which was introduced in 2017. V.H.P. stands for "Very high precision;" the timepiece is powered by a remarkably accurate quartz movement that deviates from the standard time by only five seconds a year. The timepiece is equipped with a perpetual calendar and a system that automatically moves the hands back to their correct positions after being influenced by magnetic fields or suffering a hard jolt. Other Conquest models are chronographs, meaning you can use them to time periods to 1/100th of a second. The Roland-Garros, Alpine Skiing, and Horse Racing models are all chronographs dedicated to sports Longines has a close relationship with. The manufacturer from Saint-Imier has been active in tennis, skiing, and horse racing for many years. They even have a line, the Equestrian, with designs inspired by stirrups and horseshoes. The automatic watches with a GMT function were designed with frequent flyers in mind. Thanks to a second hour hand that makes one full rotation every 24 hours, you can easily see what time it is in a different time zone. The diamond watches in the series have a feminine look with sparkling diamond-set dials and bezels. These smaller watches, measuring between 29 mm and 36 mm in diameter, are perfect for a woman's thinner wrist. 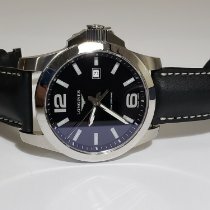 How much does a Longines Conquest cost? You can purchase a pre-owned Conquest for a few hundred euros. Well-maintained quartz watches from the 1970s are often available for less than 500 euros; you'll also find many vintage watches with manual or automatic movements in this price range. Models from the 1950s, the early years of the Conquest, cost between 1,200 and 4,000 euros. It's possible that the value of well-maintained watches from this time will continue to increase. New three-hand stainless steel quartz models with a date display are available for 500 euros and chronograph versions are available for 800 euros. New automatic watches with a date display cost at least 900 euros. If you want to be able to time exactly to 1/100th of a second, then you should be prepared to spend around 1,000 euros on a timepiece. Automatic GMT watches are about 200 euros more expensive. Extremely Precise: The Longines Conquest V.H.P. The 2017 Conquest V.H.P. is a technological highlight in the Conquest Collection. Thanks to its extremely precise quartz movement, it only deviates from the proper time by five seconds a year. To compare, a chronometer-certified quartz movement from Breitling may deviate up to +/- 25 seconds a year, and a timepiece from Citizen or Seiko may deviate +/- 10 seconds a year. The Conquest V.H.P. 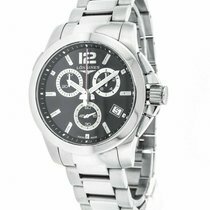 is available as chronograph or a three-hand watch with a date display and there is a choice of dial color. A special function of this timepiece is its so-called gear position detection system (GPD), which remembers the location of the hands and automatically moves them back to the correct position if the watch is affected by magnetic fields or rough jolts. Normally, a shock or magnetic field immediately impacts the time on a mechanical timepiece. If you need to manually set your Conquest V.H.P., you can do so using the smart crown. The crown can detect if it needs to correct the hands by just a few minutes or a couple of hours. It works like this: If you turn the crown quickly, the hands jump an hour forward or backward. If you turn the crown slowly, the hands move at their normal speed. You can also use the smart crown to set the perpetual calendar, which runs correctly until the year 2400. By definition, you never need to manually correct a perpetual calendar, but if you cross the International Date Line, you would need to change the date. 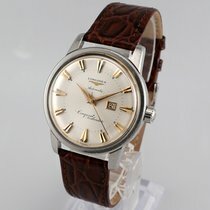 Even the battery life of the Longines Conquest V.H.P. leaves many quartz watches in the dust. Most require a new battery after three years, while the battery in the Conquest V.H.P. lasts an impressive five years. The Conquest V.H.P. 's quartz movement was made exclusively for Longines by ETA, a company which also belongs to the Swatch Group. The Conquest Collection features many different quartz chronographs which you can use to time to 1/100th of a second. The "1/100" inscription at eight o'clock indicates that the timepiece is powered by the caliber L440, based on an ETA caliber. The 12-hour counter is at 10 o'clock and the 30-minute counter is at two o'clock. The small seconds is at six o'clock, and you can read the current date at four o'clock. There are two central stopwatch hands for timing seconds and hundredths of seconds. You can use the scale on the edge of the dial to read how many hundredth of seconds have been timed. The dial colors available range from gray to black to silver. Contrasting subdials on some models make the timepieces easier to read. These watches also stand out due to their unique stainless steel and ceramic bracelets. The combination of these materials emphasizes the overall sporty-elegant look of these timepieces, although leather straps with a fold-over safety clasp and push buttons are also available. Scratch-resistant and non-reflective sapphire glass protects the dial of the 41-mm watch from damage. Versions of this chronograph are also available with a 36 mm diameter. The Conquest series has a long history stretching back 60 years. The first models were introduced to the market in 1954, shortly before the famous Flagship. The earliest Conquest watches had a much more classic design than the current sporty models; they had gold cases, a diameter of 35 mm, and a dial resembling the Omega Constellation, giving them the look of a typical 1950s men's watch. In celebration of the 60th anniversary of the series, Longines launched a limited edition model, the Conquest Heritage. The newer timepiece closely resembled the originals from 1954. Its 35-mm diameter is unusual by today's standards, as larger watches have been the trend over the past few years. 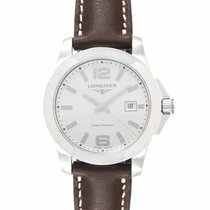 The combination of the smaller size and overall classic design make this retro timepiece the perfect men's dress watch. New stainless steel watches are available for less than 1,000 euros; new gold models cost around 4,000 euros. However, a well-maintained vintage Conquest can go for a similar price.